Forty-four percent of respondents call the health-care law a bad idea, while 31 percent believe it's a good idea -- virtually unchanged from July's NBC/WSJ survey. By a 45 percent to 23 percent margin, Americans say it will have a negative impact on the country's health-care system rather than a positive one. 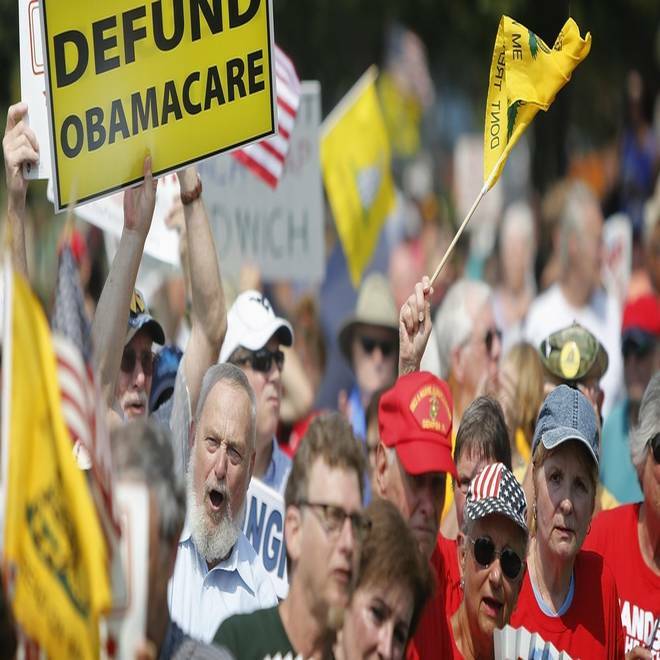 Attendees cheer at the Tea Party Patriots 'Exempt America from Obamacare' rally on the west lawn of the U.S. Capitol in Washington, September 10, 2013. And 30 percent of respondents think it will have a negative impact on their families. Just 12 percent think it will be positive and a majority -- 53 percent -- don't believe it will have an impact one way or another. Others remain confused about what's in it. “I don’t know personally how it’s going to affect me,” said another GOP-leaning opponent of the law from Ohio. That's compared with 30 percent who understand it either "very well" or "pretty well." NBC's Domenico Montanaro looks at the upcoming – and familiar – congressional fights on government funding, the debt ceiling, and defunding Obamacare. As it turns out, that 30 percent has more positive opinions about the health-care law (42 percent good idea, 45 percent bad idea), versus the 34 percent who don't understand it very well (17 percent good idea, 44 percent bad idea). Yet a lack of information isn't the only hurdle that the Obama administration and its allies face in implementing the law. For one thing, a whopping 73 percent of respondents say they're already satisfied with their coverage.